I always worry about coherent systemic approaches to all things, just as I worry about the straightforward application of theories evolved through physical and life sciences to social science — they often throw up interesting things, as Emergence did, but still they remain problematic. Fritjof Capra does not escape my critique entirely, but his coherent, systematic approach is based upon an understanding of networks, of relationships between things being as fundamental as things themselves (how dialectical of him really, though there is not a ounce of dialectics otherwise), of constant change and never a full knowledge of the whole, of humility in scientific inquiry, of anti-capitalism in the sense that we must substitute new values for that of profit above all that exists now and has brought us almost to to the brink of destruction. He is also rigorous and smart, and my critiques of the sections on social science are offset by my appreciation that he actually read and grappled with Manuel Castells’ three volumes on networks. I also like that he tries to bring together the material and the social — the geographers are missing from his account, but I forgive him, as I too think this is key. Clearly how we think about cities, housing, transportation, infrastructure and &c. are key to survival of ourselves as a species and the planet as we know it now. Of course, if we destroy ourselves, I have every confidence that life will continue to emerge and flourish. Life is pretty amazing. They did not stop the experiments but continued on, pushing against the certainties of our knowledge. Allowing that the world might be greater, wilder than we had ever imagined it. It is the findings of quantum physics, in some ways, that have opened up every other field. They have shown the world is not as we thought it was, that by the very act of studying it we enter into a relationship with it and thereby change or fix its behaviour. He brings up Saussure here, as you would, the structuralist view that words obtain meaning only in relation to other words, to phrases. No Voloshinov though, to further complicate things with the ways that meanings are further contested. Ah well. I also like being reminded of the wonder and unimaginable timescale of our emergence. So I suppose in the great scheme of things it is not so terrible that we have been stuck imagining things as static and fixed for some time, when in fact they are growing and learning. I like this boiling down of things to simple definitions. If only because I then want to complicate them anew. There is a strange section about corporations, and management’s interest in his work as a way to repair these massive and ailing behemoths. I feel that management, like science, once held a very precise view of our ability to impose our will on the world which hasn’t quite shifted fully. 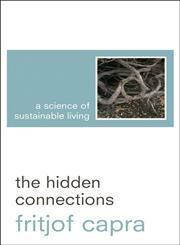 After this framing of the key nature of networks and relationships in both biology and social science, the book moves towards what sustainability should look like, how we can achieve it based on this new knowledge. We can imagine a radically different kind of biotechnology. It would start with the desire to learn from nature rather than control her, using nature as a mentor rather than merely as a source of raw materials. Instead of treating the web of life as a commodity, we would respect it as the context of our existence. We build connections, networks, challenge capitalism and arrogance. We look to increase diversity, decrease consumption and above all increase our own ability to work together to increase our abilities to collectively change and shape our world. A wonderful book on creating place — it resonated so much with all I have learned in years of working and planning with community, and it is so good to see so much of it thoughtfully consolidated and codified. Especially in such different contexts. It calls to some extent on popular education figures I know like Freire and Illich, but to a much greater extent on figures from the development and planning world who I do not yet know and am looking forward to meet. We hope to create places that allow us to achieve our dreams. Instead, looking at the barren but massive new developments occurring in London (and elsewhere), it seems clear that the desires of capital are to erase the city of all that does not maximise profit — and thus erase the city itself. And us. We live our lives within these larger forces, and our lives are destroyed by them — so we cannot allow this small scale work to be coopted, rather ensure it is feeding the resistance against destruction. I won’t get started on his example of selling water. This is always the tension I think. I like the idea of ’emergence’ that runs through everything. Inspired by studies of slime molds which aren’t perhaps the most inspiring of creatures, I do love this idea of horizontality and networking and allowing things to emerge from the collectivity as they are needed (and have written about Emergence by Steven Johnson where much of this thinking comes from here — it contains many of the same issues I have with Hamdi and more…). At some point, of course, these horizontal emergings will run smack into the wall of hierarchical power which is rarely on the side of true ‘progress’. And they will have to fight. I believe they can, they are not necessarily subsumed into another level of support, bribed and coopted by such power that often made their organising necessary in the first place. But they can be. We are right to be cautious. And I love thinking, have been obsessing over, the importance of dense networks in all aspects of life and health. I particularly love that he challenges the consensus model. We are different, we do not always have to agree to work together or let important issues be subsumed or relegated to the future because we are a minority. I also like this idea of outsider as catalyst for change, and how this change connects to wellbeing. I feel like that is one of the things poor people always fight for and never get and so this is the most obvious thing in the world, but few others understand it, much less respect people who are not of their class (or skin colour or gender or sexuality or…). The goal of becoming wise…I wish we taught more students this way, they are instead content to be clever. But then, so are most of their teachers.